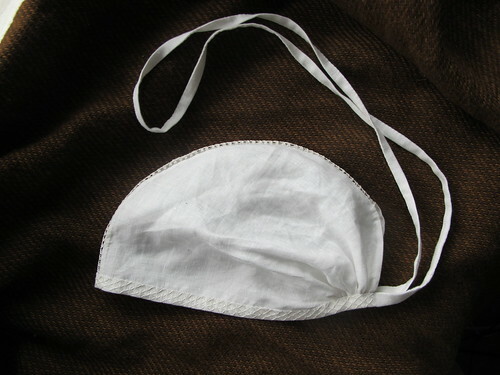 After having my old St. Brigitta’s cap for several years, and not really liking it that much. 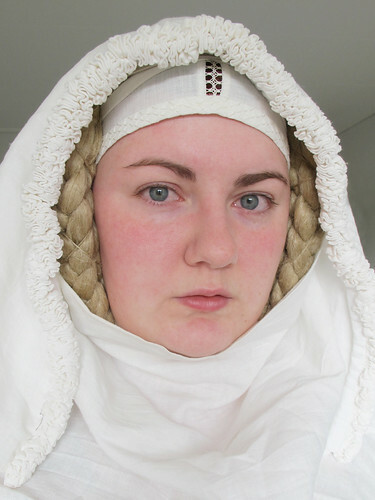 Well I like the cap itself as it is the best thing to pin your veils to, but it was a bit on the rough side with a bit to thick linen and also the band over the seam seemed like a good idea at the time but I don’t want it to show when wearing my frilled veils. 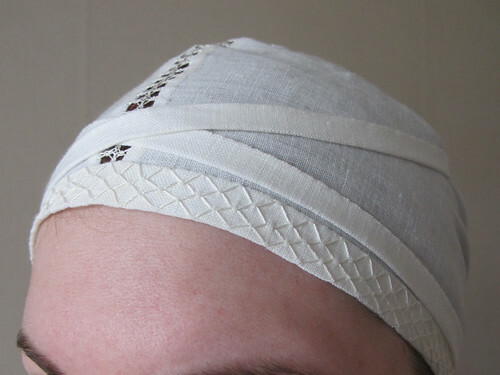 Also the original cap have a lace embroidery over the head and in front on the band. 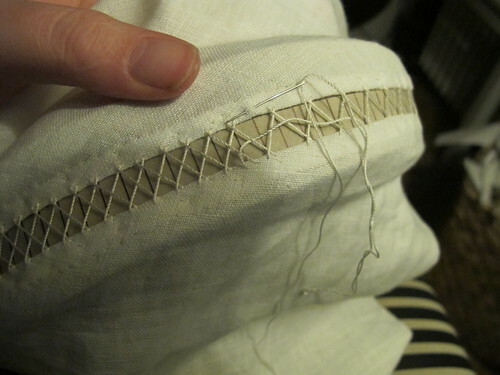 Making a new one is not that much work either, and the embroidery part was much easier than I thought. 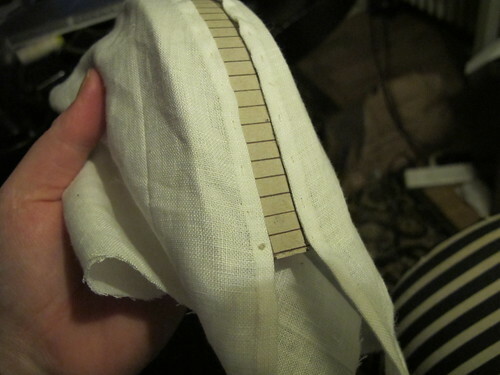 I started by cutting the cap part out, in stead of sewing the back seam together I hemmed the two parts individually. 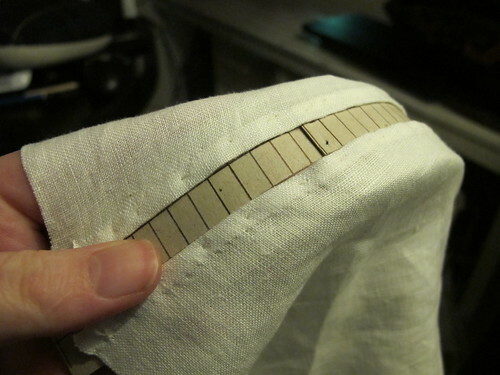 Then I basted the cap to a thin cardboard that I had marked out some guide lines on to make it easier to embroider, the gap is 1cm wide and the markings are 0,5cm apart. 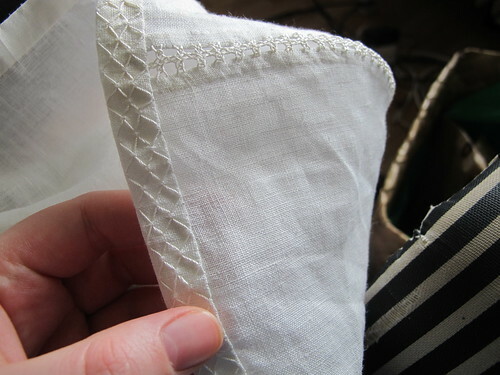 I used this excellent guide for the embroidery for the interlaced herringbone stitch. I recommend looking at the guide in stead of my pictures, it is very clear. My pictures was mostly to show the progress on facebook. 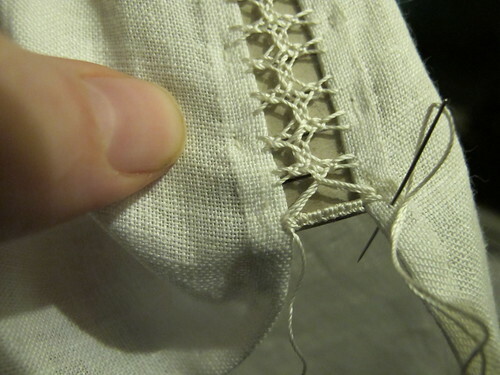 I used a silk buttonhole tread for my embroidery, it became very delicate and nice, the original cap was probably embroidered with linen thread. 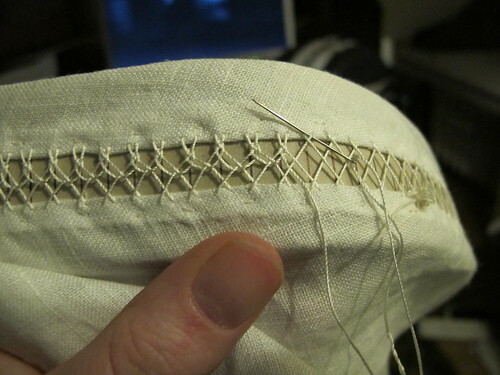 At the end where the slit in the cap will be I made a bar by making buttonhole stitches over a couple of treads. 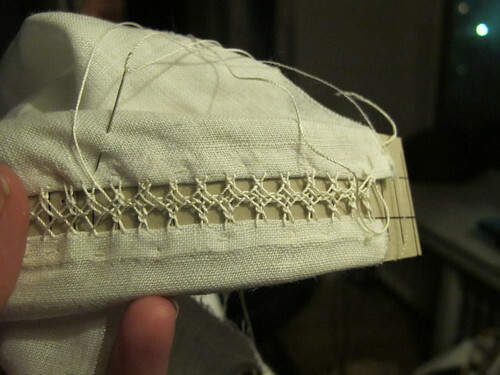 In the front I made a embroidery inspired by this picture on Medieval Silkwork. And this is how it looks when finished. 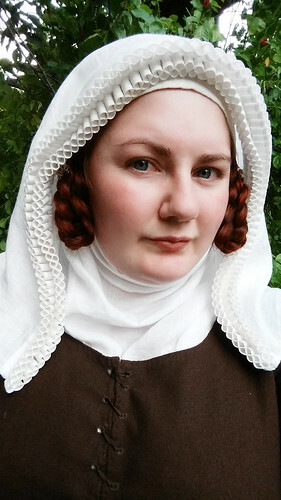 And also how it looks when worn with a frilled veil, and also here with some flax cornettes I made a while ago. 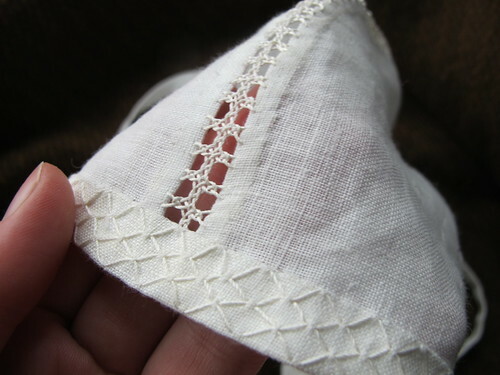 I love how the lace embroidery is seen under the veil. 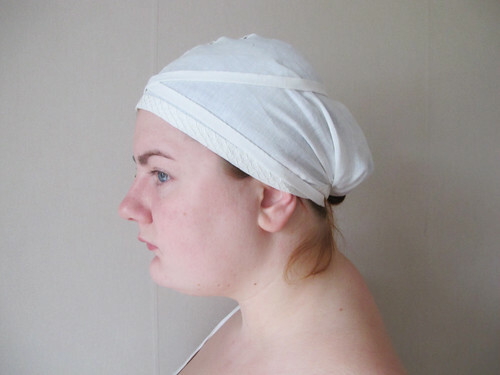 If you want to make your own St. Birgitta’s cap here is a tutorial with a pattern. You really do make the most amazing tutorials! I cannot wait to try this one. Thank you again for posting these. Thank you very much. Det er så godt at se og det hjælper mig rigtig meget. Du er meget dygtig. Hilsen Else Marie in Denmark. I hope you understand Danish, I can´t so much English. What is the name of the embroidery that you used for the band around the cap? Beautiful job! I used your technique to make my own. It was my first attempt, and I made quite a few mistakes, but overall it came out really nice. thank you for providing this tutorial!